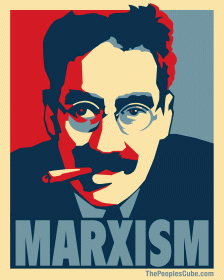 Marxism………or one of the funniest men who ever lived……..
Wow, two posts in one day. 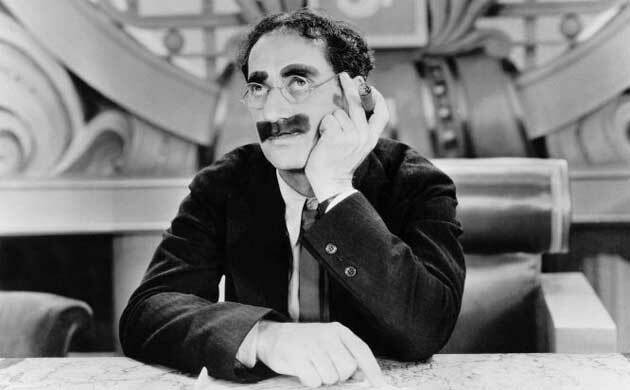 Because this was fun to do and because Groucho received an honourable mention in my last post I thought I would trot out my favourite Groucho quotes, plus, a rare quote lifted from a radio snippet which I love. I understand the people of a certain generation don’t get this. But don’t you just wish you could be this quick witted – though you might not have many friends left. Enjoy the man and his humour. We took pictures of the native girls, but they weren’t developed. . . But we’re going back next year. I’m 42 around the chest, 52 around the waist, 92 around the golf course and a nuisance around the house. Send 2 dozen roses to Room 424 and put “Emily I love you” on the back of the bill. You can leave in a taxi. If you can’t leave in a taxi you can leave in a huff. If that’s too soon you can leave in a minute and huff. “Well, art is art, isn’t it? Still, on the other hand, water is water! And east is east and west is west and if you take cranberries and stew them like applesauce they taste much more like prunes than rhubarb does. We’ll meet at the theatre tonight. I’ll hold your seat ’til you get there. Once you get there; you’re on your own. I repeat sir, you’re a contemptible cur. If I were a man you’d resent that. G. So, Mrs. ………, you have 11 children. That’s a lot of children. Mrs. X Well, sir , I love my husband. G. I love my cigar but I take it out from time to time. I’ve always wanted to possess that sort of wit. Like Groucho or Dorothy Parker. While I can be funny, that quick retort is not my forte. “I love my cigar but I take it out from time to time.” Priceless. And it was extemporaneous, done right there on live radio. Brilliant. The radio show was recorded in front of a live audience and they just wet themselves at this point. Great wit.